The Grand Suite is located on the second floor of the house. With outstanding views out across the lawns and countryside beyond and ample space to relax and unwind. The Grande Suite is a perfect choice for a truly indulgent Cotswold luxury hotel escape. Recently redesigned, the main bedroom features exposed beams and a sitting and study are. 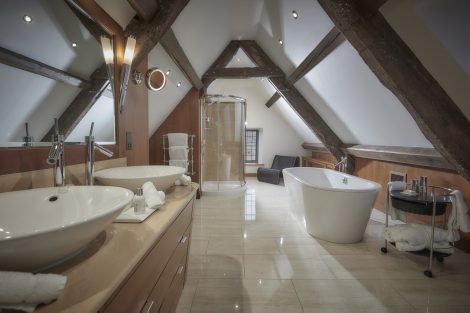 The unique bathroom also features a Philppe Stark free-standing bath. Featuring a super-kingsize bed handmade in Yorkshire by Harrison Spinks, thousands of pocket springs ensure the most comfortable experience. Lots of indulgent treats are also waiting in your suite for you. Homemade biscuits & elderflower cordial, still and sparkling mineral water, Whatley Manor chocolate bar, coffee and tea making facilities. Both bathrooms have heated floors and offer Molton Brown amenities. The Grand Suite benefits from efficient WiFi and our chrome cast TV’s allow you to stream directly from your own devices. Enjoy full use of the award winning Aquarias Spa during your stay. Unwind, indulge and escape in this tranquil and rejuvenating space. A deposit of 30% of the total amount is required on booking. If you cancel your reservation within 72 hours a cancellation charge will apply. A 10% discretionary service charge is added to your bill. This service charge is shared amongst the team at Whatley Manor.